Loyalty rewards programs have become such a natural part of our buying experience, that we might not even know the precise number of these programs we’re involved with. There is only one reason why they are so much popular - rewards programs really work, turning “one time” customers into loyal and recurring ones. The logic behind is simple: since customer acquisition costs 6 to 7 times more than keeping existing ones, it’s better to give your clients a reason to get back and make another purchase - repeatedly. Loyalty program centered on earning and using reward points is among the most typical and effective ways of customer retention and AOV increase. But how does it work on practice? Whenever a customer purchases or performs a specific on-site action, he or she gets a certain amount of points - a digital currency that can be converted into a discount, gift or money. Rewards Program Helps Distinguish. Customers have tight budgets but numerous options from where to buy. Thus, you need to offer them something little more than the others - a reward for making a purchase, for example. That will help you to stand out among the increasing number of e-stores and give your customers a reason to choose exactly your online retailer. Rewards Program Will Bring ‘em Back. Knowing there is a possibility to get a pay off won’t let your customers indifferent. Rewards programs are designed to increase loyalty, which in turn, results in raise of return visits. Rewards Program Increases AOV. The main rule of earning reward points is - the more money you spend, the more points you get. As follows, in a pursuit for a “prize”, reward points collectors tend to spend more than they originally would. If it sounds convincing enough, you have no other choice but to give it a try. Numerous plugins allow to launch your own points-based rewards program in terms of 15 minutes and don’t require any coding skills. Keep it Simple. Don’t invent complicated algorithms of estimating reward points value. Make your 1/10/100/ points worth $1. Also, clearly determine what and how something can be bought with the help of reward points. In such a way, customers will easily figure out how much money they’ve already earned and how they can spend them. Make it Worth. Ensure your reward points worth collecting and spending. Don’t put too much restrictions on the way they can be used and do not make it too hard to earn them. If it seems to be unreachable, then it has no value. Count Every Purchase. To get the most of your rewards program, every product purchase should earn some points. The fact that every buy has its worth will motivate customers to make all the possible purchases exclusively from you. Count Specified Actions. Use your rewards program as a unique and effective marketing tool. Offer customers to gain some points for performing specific actions - sharing on social networks, signing up and leaving an email, reviewing products, comment your blog, participating in A/B testing etc. Multiply Earning Rate. Offer x2 reward points earning rate for a specific period of time or on a defined range of products and stimulate the customers to buy more. It’s an effective way to rapidly encourage sales from point collectors and increase revenue. Hopefully those several tips and ideas will help you to establish your own successful loyalty rewards program. In case you’re already running a rewards program and willing to perform shopping cart migration but afraid to lose its data - fear no more! From now on Cart2Cart offers the possibility to migrate reward points of your customers for a limited number of platforms - fast, easy and automatically. 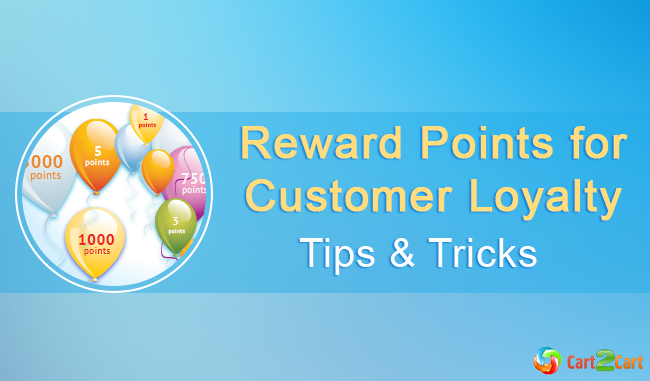 One thought on "Tips & Tricks - Reward Points for Customer Loyalty"